I did Pilates on the Reformer today and really noticed my SI joints bothering me. I think it was the short spine exercise. Hi Nicole and thank you for your question. I believe you are correct in that the short spine, if not done with proper control using the abdominal muscles can definitely aggravate the si joints. This is an advanced exercise and if the transverse abdominals are not activated properly the back and hip muscles take over and can become aggravated by the excessive pulling on the spine and through the si joint. I would practice doing bridging with proper technique first so you get the feeling of how to properly articulate the spine using the abdominals. Check out the proper way to do bridging here: Pilates Bridging. And...here's a great page about exercises for SI Joint Pain. Legs in straps, Leg Lowers, and Leg Circles help me, but I need much more. Hello Suzanne and thank you for your question. 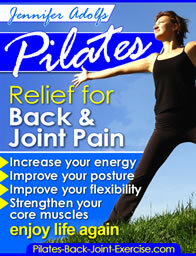 You are right in that there are many more exercises you can do on the Reformer for pelvic and SI joint stabilization. Try the frog legs in the straps on the reformer, I especially like this one with, what you call the leap frog. Pull heels in towards your sitz bones, then keeping the carriage still press your heels straight up to the ceiling and then move the carriage as you press your legs straight down together. Do the frog leg exercise with each leg individually as well, being sure to keep the hips level (not rocking back and forth). Bring your heel straight back to your sitz bone on that same side and then push the heel straight out with your foot still externally rotated. Also, try abducting the legs at a 45 and then 90 degree angle with your feet turned slightly inward and keeping the carriage still as you do this. Zip from the pelvis and then feel the inner thighs working to close the legs all the way. The thigh stretch kneeling on the reformer with hands on the foot bar and then swinging the hips in the hip socket is a good exercise to strengthen and stabilize the pelvis and si joint. When preparing for the thigh stretch press out from the footbar extending your arms and letting them sink into your armpit to get the chest open and scapula stable. Your spine should be in neutral and the knees under hips to start with, then begin pulling your knees toward your chest and then pushing back out the length of your lower leg bone. All the various footwork positions with feet on the foot bar, as well as working the legs individually is good for pelvic and si joint stabilization. You can try doing legs in side kicks by lying on your side with the top leg in the strap and working up and down, small circles, and front and back swings. I also like working the SI Joint using the leg springs on the cadillac if you have access. They create even more challenge than the reformer and work on the leg length/tension imbalances individually. Check out this page for some mat related SI Joint Exercises. Very good point about working one side at a time for stabilization! As an instructor, I'm going to remember to focus on that more.